Ayurveda defines happiness as health, and health as an equilibrium of the dhatus or bodily tissues. We build our bodies through the absorption of nutrients from food. Food is essential for life and all of its experiences. What we eat we become, a phrase which is well-known far and wide. But how exactly does food feed the body? How is it built and in what order? Ayurveda defines happiness as health, and health as an equilibrium of the dhatus or bodily tissues. The seven dhatus (in order) are Rasa (plasma), Rakta (blood), Mamsa (muscle), Meda (fat), Ashti (bone), Majja (bone marrow) and Shukra (reproductive fluid). When food is properly digested and assimilated the building of the individual tissues begins. The first tissue created is plasma. the tissues are then built sequentially, in order, with each layer being built from the one immediately preceding it. Each dhatu has accessory tissues and a waste product. If the dhatus are appropriately produced and healthy, and the wastes are minimal and rapidly eliminated, the individual experiences health and well-being. This is why digestion, assimilation and excretion are essential to our health at every level. The word rasa literally translates to “juice.” It refers mainly to plasma, but also includes other tissue fluids such as chyle or lymph. Its accessory tissues are breast milk and menstrual blood. Rasa’s waste product is mucus and its function is Prinana, which means nourishing the body. Rakta refers mainly to red blood cells. Its accessory tissues are blood vessels and tendons. Rakta’s waste product is bile and its function is Jivana or invigoration. Meda includes fat in the limbs and the torso. Its accessory tissue is omentum and its waste product is sweat. Meda’s function is snehana or lubrication of the body. Ashti englobes all bones. Its accessory tissues are teeth and its waste products are body hair, facial hair and nails. Ashti’s function is dharana or supporting the body. Majja refers to nerves and the contents of bones, which includes red and yellow bone marrow, the brain and the spinal cord. Its accessory tissues are head hair and its waste product are lachrymal secretions. Majja’s function is Purana or filling of the bones. Shukra refers to both male and female reproductive fluids. It has no accessory tissues and no waste products. Shukra has two functions, garbhotpatti or reproduction, and the production of ojas, the fluid which creates the aura and controls immunity. Each dhatu is nourished and therefore built from the one immediately preceding it. An imbalance in any of the dhatus will result in an imbalance in all the following layers. Therefore, an imbalance in plasma, will result in an imbalance in blood, muscle, fat, bone, bone marrow, nerves and reproductive fluid. Only the right diet and proper digestion will ensure balanced and appropriate tissue renewal. In this specific situation, the word nourish does not refer to the extraction and assimilation of nutrients, but rather to the creation of an appropriate metabolic environment. For example, if our plasma is unhealthy, the body’s metabolic environment becomes less conductive to the proper formation of blood. The blood will then be less able to build strong skeletal muscle. When one dhatu completely converts itself into another. i.e. A large part of the circulating plasma is converted into blood. When one dhatu nourishes the next dhatu by sending out hormonal or enzymatic signals. This is the way fat nourishes bone. The waste products at each dhatu are diagnosed in Ayurveda to analyse an individual’s health level. As any excess waste at any level is indicative of poor digestion at the dhatu’s level. It also shows which dosha has entered the dhatu, and created the imbalance. 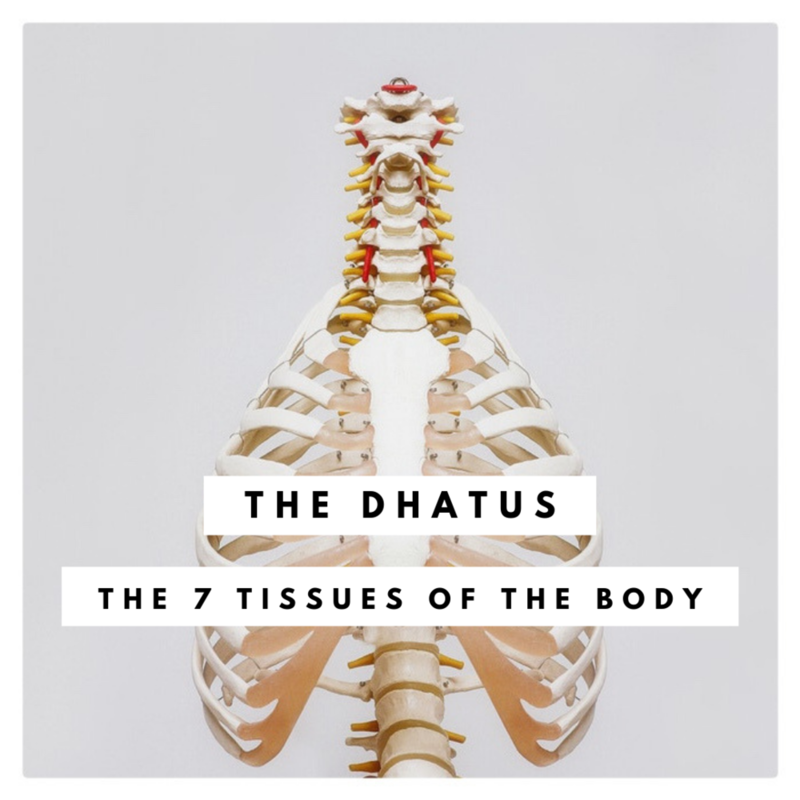 Understanding the seven dhatus and their roles, is essential to understanding the nature of pathologies and their symptoms, and providing quick an effective treatment for many disorders.